If you are unhappy with your smile. If you cover your mouth on photos. If you feel self-conscious when you open your mouth, Then We May Have the answer for you! Introducing fast, discreet, straight teeth systems to give you the smile you desire in just a matter of months. There are thousands of people like you who think the same things. Unbelievably it is never too late for you to get the smile that you want, and with the advances that have been made within dentistry there is no need for you to wear unsightly braces for what could be years on end! Everyone’s smile is unique to them, and because of this there are a number of techniques we use so that your dream smile can be achieved. You no longer have to wear those ‘train track’ braces for months – or even years – on end to achieve a perfect smile. Here at Start Smiling Dental Practice we use treatments that will perfect your teeth in as little as 6 weeks! With the clear solutions we offer, no one need know that you even have a brace in! Download Your FREE Guide Today. 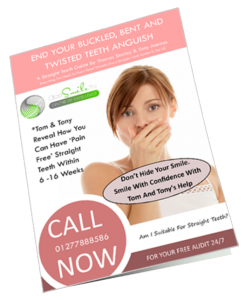 We invite you to read his informative guide on straight teeth “How People in Essex Can Now Say Goodbye To Their Twisted, Crooked and Uneven Teeth”- which is yours just for the taking, without any obligation whatsoever. This simple to follow colour booklet will also tell you the common myths associated with straight teeth and allows you to find out more about the straight teeth treatments available at Start Smiling. Furthermore, it explains how to arrange a free Am I Suitable For Straight Teeth Consultation if you so require. I was a very nervous patient when I first arrived at start smiling but Tony and his team soon put me at ease and made me feel comfortable. They work in a very friendly environment and are very welcoming. Tony gave me many options on how to get the perfect smile. I chose C-Fast braces and within just under a year he achieved the most amazing results. I am so pleased with how my teeth look and feel now and for the first time in my life I can ‘start smiling’. We have many different options for you if you are unhappy with your teeth and smile. 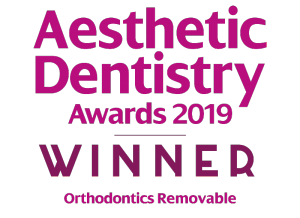 For many people, braces can be the perfect solution, for others veneers are they way forward and for some just a little cosmetic bonding will help to achieve that perfect smile. Below are some examples of patients that we have treated with braces. You can see how their teeth looked before the treatment and how they had changed by the end of the treatment. Hopefully, this will give you an indication of the types of problems that we can correct with braces. Removable Clear Aligners is an innovative orthodontic treatment which can give patients the smile they want, without the traditional problems and obstacles that come with traditional braces. Removable Clear Aligners works via a series of virtually invisible braces, which are comfortable to wear and are completely removable. 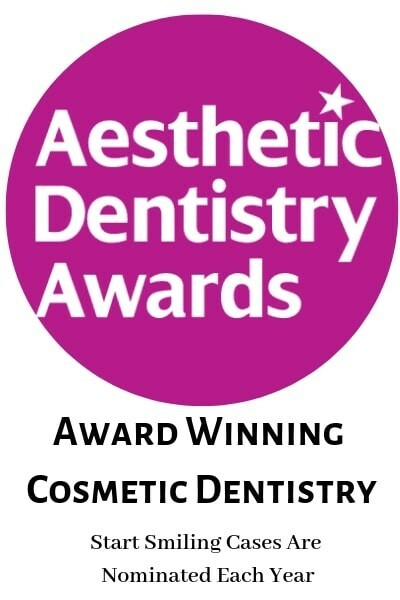 Each bespoke aligner is changed on a fortnightly basis, in order to gently move the teeth into the desired position. 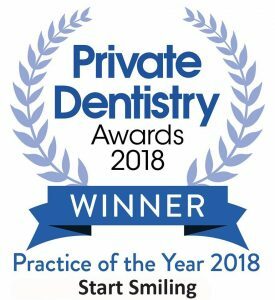 Not only does Removable Clear Aligners offer results that are on a par with traditional orthodontic treatments, but it is also incredibly discreet and avoids the stigma and embarrassment that other traditional brace systems can cause.The level of discreetness and comfort that Removable Clear Aligners is able to provide makes it an ideal treatment for both adults and younger patients. Crooked teeth and ‘crowding’ are common dental problems, but many people fail to seek treatment for these issues because they are worried about what the treatment will involve. Uncomfortable orthodontic treatments and unsightly braces are among the most cited reasons for avoiding orthodontic work. However, numerous modern braces are now available, which are a great deal more comfortable and discreet. C-Fast fixed braces is just one of these innovative new systems and offers patients discreet and highly effective treatment, which is capable of creating the smile of their dreams in only a fraction of the time you would normally expect. C-Fast fixed braces uses unique tooth-coloured wires and brackets and focuses only on the teeth that are prominent when a patient smiles, instead of attempting to realign a person’s entire bite. By cutting to the core of the problem, patients can see real results in a timescale that was previously unthinkable. This is also an ideal treatment if you have a special event coming up, as it can prepare your teeth quickly and make sure you are not rushed for time. Treatment is usually completed in 3-6 months.The C-Fast fixed braces system is comfortable and requires fewer trips to the dentist than other fixed brace treatments, which could also mean a reduction in costs – something else to make you Start-Smiling. The Inman Aligner is a unique and customised orthodontic appliance that offers one of the easiest and stress free ways to efficiently straighten crooked teeth. The way in which the Inman Aligner works is by applying pressure to the teeth through two different mechanisms; first, a lingual coil spring designed to apply force onto the teeth being corrected, and secondly with a labial bar that works to push back that same force. This push-and-pull technique gets the teeth into alignment by almost squeezing them together. The Inman Aligner is perfect for mild to moderate problems with the front top and bottom teeth and is for the exclusive use of adults. If you are suffering from twisted and crowded teeth and are interested in finding a solution, please complete the Free Smile Analysis form below to see if you are suitable. Meeting up with a team member at our practice or if you are nervous we can arrange to meet at our local coffee shop. You can relax with a hot drink while you chat about how, and in what ways, Start Smiling can help to improve your smile. Pain Free And We Can Prove It! We are easily accessible by train, being only 20 minutes away from Liverpool Street station. If you plan on driving however, we also have plenty of room for parking at the free 2-hour carpark opposite the Practice. Dental Complaints Service, Stephenson House, 2 Cherry Orchard Road, Croydon, CR0 6BA, Tel: 0845 120540. 84.61% of people surveyed last month, agreed their treatment was Pain Free!